Deck the walls of your Occupy tent and color the sidewalks, then get yourself on home for your usual seasonal merrymaking. Occupy Humboldt's takin' a break. Please help make Thursday, Dec. 8 a beautiful day. In celebration of our beautiful Occupation, we will be hosting a rally/jamboree. After a fantastic 'American Autumn', we will be packing it up on the morning of the 9th, for Winter Break. For the festivities on the 8th, please see the line up below, and share this link! Many of us will be spending the night of the 8th at the encampment. Please join us! BRING TENT!!! BRING INSTRUMENTS!!! JOIN US!!! INVITE PEOPLE!!! SPREAD THE WORD!!! 2:30 -- 5:30 p.m.: Rally! Move to Amend Teach In and Rally! Learn About the Corporate Take Over of Democracy, and How To Take It Back! 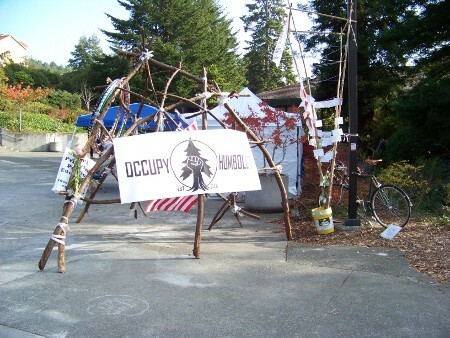 5:30 -- 6:30: Occupy Humboldt, Calif.
6:30 p.m. till Bedtime: DANCE PARTY!!! Morning of Dec. 9: Roll Up the Encampment! Please share this invite with your friends and social networks.